Table etiquette is a big issue for many people. They feel nervous about if what they do at meal time is appropriate or not, especially if they are with their bosses or with that special someone they are trying to impress. 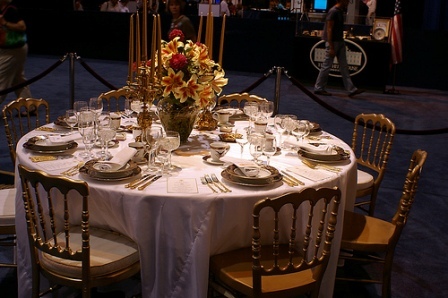 More importantly, table manners are a reflection of your upbringing and respect for others. Table manners also serve as one of the first things we teach our children. It is not a matter of being "stuffy" or "snooty", but a way for the child to demonstrate his/her ability to function within the norms of society. More importantly, it is a way to provide the child with the self-confidence that he/she understands what is expected and how to operate properly in this environment. To have good table manners you have to get rid of some habits and replace them with good ones. All you have to do is to know what habits you need to replace and what habits you need to acquire. According to the experts, an action becomes a habit in less than thirty days if you do this action regularly, so, if you practice good table manners every time you eat, whether you are alone or not, it will become second nature in you in a very short time. Think about what a short time thirty days are in relation to having a lifetime of being comfortable with others at meal time. Also, when you go to a restaurant, don’t forget to tip. Tipping etiquette is as important as good table manners: they go hand-in-hand. Just as table manners is a way to demonstrate respect for your co-workers, friends, family, and business partners, so too proper tipping is a way of demonstrating respect for those who serve you in varying capacities, making your life easier and more convenient. Tipping is a simple way of saying "thank you". Remember that the guidelines on the tipping page are generally minimum expectations. If you believe the service provided far exceeded the norms, do reward the service provider accordingly.